Welcome to Sunsigns.Org’s Rashifal 2019 predictions for the coming year. These Bhavishya Jyotish 2019 forecasts are based on Vedic Astrology and are very accurate. Find out how you will fare in the coming year when it comes to love, health, career, family, finance, money, travel and relationships. Thus, the 2019 Rashiphal helps you understand your future and plan better. This way you would not be shocked by challenges that might come your way. Find out your Vedic moon sign from our free Rashi calculator. Get free yearly astrology forecasts for the 12 Rashis namely Mesh, Vrishabh, Mithun, Kark, Simha, Kanya, Tula, Vrischik, Dhanu, Makar, Kumbh, and Meen. The 2019 Mesh Rashifal predictions are sure to make you brace yourself for all the positive and negative things that may occur in your life this year. You will have significant financial success this year due to the career you choose. The dreams you have had, as regards your job will come true this year. 2019 Vrishabh Rashifal foretells that happiness will be in plenty in your life this year. 2019 is the time for Vrishabh natives to explore their talents in wanting more for their career and their life as well. Mithun Rashifal 2019 reveals that you will face a lot of challenges in your life this year. Good things come out of the worst of situations. Therefore, prepare to enjoy the good at the end of the torturous journey. The new adventures you invest in will also bring you high returns. As the year progresses, your finances will improve. Also, Kark Rashi individuals love traveling mostly for work purpose. Happiness will follow you everywhere you go in 2019. Love will be easy to come for Simha Rashi natives since people around you including your friends will lean closer to you in 2019. You will integrate new talents and skills into your work to enhance the level of your professionalism. The family is essential to every being in this world, and that includes Kanya Rasi natives. But, you will have a great time traveling from place to place. Nothing will come between you and your happiness apart from your health which you should take care of from an early stage. The Thula 2019 Rashi predictions reveal that you will do well in your career. Also, you will experience the satisfaction that you have been yearning for a very long time. The 2019 year is a good one, therefore let is also be good when it comes to your family. This will be a year of success for you when it comes to your career. You love spending a lot. This will have to change in 2019 if you want to make something of your money. 2019 is a good year for love, marriage, relationships and pregnancies. The Dhanu Rasi are out to make the best out of their life in 2019 no matter the challenges that come at them. The year will start on a high note for you. But, you will enjoy physical, emotional and mental health like you have never done before. Your finances will be okay this year since you are good at saving money for future expenses. Makar Rasi natives will have happy marriages this year. You will be traveling to meet investors or to explore new business ventures that are open to you. According to the Kumbh 2019 Rashifal horoscope, you will be happy with your health this year. You will have a successful financial year this year. The past has been all about work, but this year it is all about spending time with the people who mean a lot to you. If you are a Meen Rashi native and you need to understand more about your future in 2019. Learn how to be an economist to know how to spend money on things that matter. You will go a long way in making a name for yourself at your workplace. 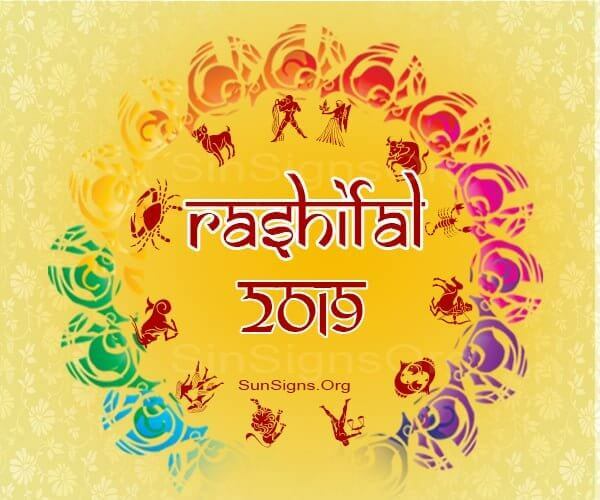 To sum it up, Rashifal 2019 horoscope predictions are a fantastic way to know your future better. Live a happy and prosperous life knowing these forecasts.